World Airways‘ (Atlanta) CEO John Graber informed staff today (March 27) the company would cease operations immediately. In addition, North American Airlines (New York) will see a reduction in flying. World operated its last flight yesterday (March 26). The company was not able to obtain further funding to keep it flying. “Today (March 27) World Airways announced that the company operated its last flight on Wednesday, March 26. 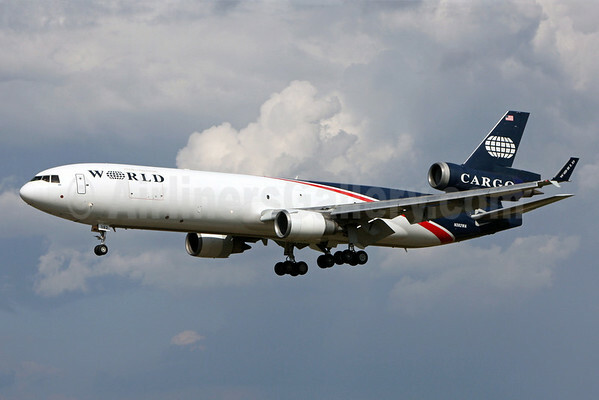 World Airways was founded in 1948 and operated cargo and passenger charter flights using Boeing 747-400 and McDonnell Douglas MD-11 aircraft. The U.S. Military was their primary customer. Global Aviation Holdings and many of its subsidiaries, including World Airways, began restructuring on November 12, 2013. World Airways has been in the marketplace for some months seeking funding to help it restructure in chapter 11 bankruptcy, and has been unable to secure that financing. Tuesday, World Airways’ first lien holder declared World in default on its loan and stopped providing the airline funding. World Airways has started the process of winding down its operations. Today the company laid-off 325 employees, including 109 pilots and 146 flight attendants. World Airways has been a long time operator going back to May 1948. Previously on November 12, 2013, parent Global Aviation Holdings and its subsidiaries, including its two operating airlines World Airways and North American Airlines, filed voluntary petitions again for relief under Chapter 11 of the United States Bankruptcy Code in the United States Bankruptcy Court for Delaware. During the reorganization, Global Aviation Holdings announced it intended to continue to operate. Copyright Photo: Brian McDonough/AirlinersGallery.com. It has been stormy skies for World Airways lately. McDonnell Douglas MD-11F N382WA (msn 48411) arrives at Baltimore/Washington (BWI). This entry was posted in World Airways and tagged 48411, Baltimore/Washington, BWI, Ceases Operations, Global Aviation Holdings, McDonnell Douglas, McDonnell Douglas MD-11, McDonnell Douglas MD-11F, MD-11, MD-11F, N382WA, North American Airlines, World Airways on March 27, 2014 by Bruce Drum. Hamburg International (Hamburginternational.de) Airbus A319-111 D-AHIK (msn 3560) NUE (Gunter Mayer) (ceases operations), originally uploaded by Airliners Gallery. Hamburg International (Hamburginternational.de) (Hamburg) shut down all operations yesterday (October 19) and filed for bankruptcy protection. This entry was posted in Uncategorized and tagged 3560, A319, A319-100, A319-111, Airbus, Airbus A319, Airbus A319-100, Ceases Operations, D-AHIK, Gunter Mayer, Hamburg International, NUE, Nuremberg on October 20, 2010 by Bruce Drum. Air Jamaica Airbus A320-214 6Y-JMF (msn 1213) MIA (Brian McDonough) (end operations), originally uploaded by Airliners Gallery. Air Jamaica (Kingston) operated its last “Lovebird” flight on April 30. Flight JM 036 from Fort Lauderdale/Hollywood to Kingston with an Airbus A320 was the last flight operated by JM. On May 1 Caribbean Airlines (Port of Spain) took over the operation. Copyright Photo: Brian McDonough. Airbus A320-214 6Y-JMF (msn 1213) arrives at Miami in the 2006 livery, the last color scheme worn by the JM fleet. This entry was posted in Air Jamaica, Caribbean Airlines and tagged 1213, 6Y-JMF, A320, A320-200, A320-214, Air Jamaica, Airbus, Airbus A320, Brian McDonough, Caribbean Airlines, Ceases Operations, MIA, Miami on May 3, 2010 by Bruce Drum. Varsity Express lasted one week! G-JIBO Varsity Express, originally uploaded by Speed-pics. Varsity Express (Oxford) after much fanfare finally started the Oxford–Edinburgh route on March 1 with a BAe Jetstream 31 (G-JIBO, msn 711) operated by LinkAir (Humberside). However the scheduled service ended one week later on March 8 after the two companies could not agree on funding. Varsity Express stated on its website that the reason for the suspension was due to the “operational issues between Varsity Air Services Ltd and the airline and AOC holder [LinksAir] who have been contracted to operate the Jetstream 31 type on our behalf and that was being used on the route. All further ticket sales have been suspended until further notice. All passengers effected by the suspension of service either have been or are currently being informed of the situation”. The company was set up and managed by Martin Halsted who gained some notority in 2005 when, at the age of 18, he announced that he would launch his own aviation business named AlphaOne Airways. It had a number of false starts. Halstead announced services from Oxford in March 2005 and later the same year from Southampton. AlphaOne Airways never flew a single flight from either airport. In December 2005 and January 2006, limited flight operations took place between the Isle of Man and Edinburgh. The company folded after having carried only 46 passengers. Photos of this one-week operation are welcome. Copyright Photo: Speed-pics. Jetstream 3102 G-JIBO (msn 711) with Varsity Express titles and logo is pictured at Edinburgh on opening day (March 1). This entry was posted in Varsity Express and tagged 711, BAe, Ceases Operations, EDI, Edinburgh, G-JIBO, Jetstream 31, New Airline, Speed-pics, Varsity Express on March 19, 2010 by Bruce Drum. Copyright Photo: Paul Bannwarth. Boeing 717-23S EC-HUZ (msn 55066) is pictured on final approach to Barcelona. Quantum Air (La Compania Quantum Air S.A.) (Madrid) on January 26 ceased all operations. The company originally started operations on July 4, 2000 with an initial fleet of three Boeing 717-200s under the AeBal (Aerolineas Baleares) brand. It was initially owned by Spanair (51 percent) and the GAS Group )(49 percent). However AeBal (Spanair Link) ceased operations on September 16, 2008 as part of the Spanair restructuring plan. SAS sold the company in January 2009 to Proturin, a Spanish investment company. In March 2009, AeBal was reorganized as Quantum Air. This entry was posted in Quantum Air and tagged 55066, 717, 717-200, 717-23S, Barcelona, BCN, Boeing, Ceases Operations, EC-HUZ, Paul Bannwarth, Quantum Air on January 28, 2010 by Bruce Drum. Flyglobespan.com (Globespan Airways) Boeing 767-306 ER G-SPNA (msn 27957) LGW (ceased operations), originally uploaded by Airliners Gallery. Flyglobespan (Flyglobespan.com) (Globespan Airways) (Edinburgh) today (December 16) shut down all operations and was immediately placed into receivership (bankruptcy protection). This entry was posted in Flyglobespan, Globespan Airways and tagged 27957, 767, 767-300, 767-306, Antony J. Best, Boeing, Ceases Operations, Flyglobespan, Flyglobespan.com, G-SPNA, Gatwick, Globespan Airways, LGW, London on December 16, 2009 by Bruce Drum.